The English-language debut of Belgian filmmaker Felix Van Groeningen, who is best known for his Oscar-nominated 2012 film The Broken Circle Breakdown, Beautiful Boy is a heartbreaking and deeply emotional addiction drama, that is anchored by superb performances from Steve Carell and Timothée Chalamet. 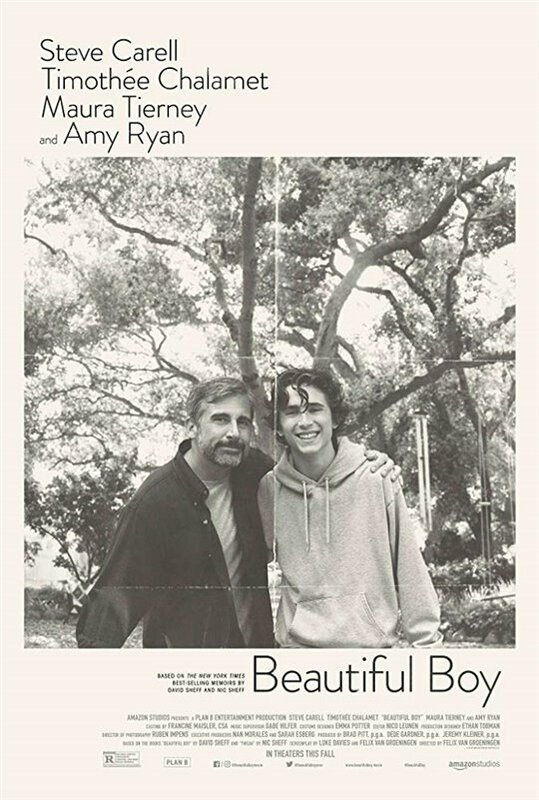 The film is based on a pair of memoirs that were written by a father and son, and harrowingly depicts the struggles that writer David Sheff (Carell) faced when trying to help his drug-addicted young adult son Nic (Chalamet) get clean, after he started using crystal meth as a teenager. The film takes a stripped down and grittily authentic approach to telling this story, charting Nic’s ongoing journey into recovery over several years, including his stints in rehab and inevitable relapses, powerfully showing how his drug addiction not only detrimentally impacted his own life, but also the lives of those around him, including his father, mother (Amy Ryan), stepmother (Maura Tierney), and two younger siblings (Christian Convery and Oakley Bull). Tackling an obviously challenging role, made even more so by the fact that he is portraying a real person, Chalamet gives a quietly devastating performance here, perfectly embodying the tics and mannerisms of someone who is trying to hide the full extent of his addiction from those around him. A year after his breakout roles in Call Me By Your Name and Lady Bird, this is the young actor’s finest work so far, and his performance becomes even more impressive after watching footage of Nic Sheff in real life. Then there’s Carell, who gives an understated and subtly moving performance as a father struggling to save his son, while coming to terms with the fact that he no longer recognizes the boy that he raised. It’s maybe his best dramatic work yet, in a widely expansive career that has seen him move effortlessly from comedies to more serious roles. Chalamet and Carell’s scenes together are deeply moving to watch, with them capturing the father-son bond in a way that feels authentic. Groeningen directs the film in a way that allows the focus to stay on the performances, and the film is, in a sense, edited to the emotional beats of the story, delivering a series of gutting scenes that together pack one heck of an emotional wallop. We focus on intimate character moments, while also pulling back to explore the larger implications of addiction, including a powerful sequence in which a doctor (Timothy Hutton) gravely tells David about the effects that methamphetamines have on the brain, with frequent use leading to reductions of grey matter and ultimately permanent, irreversible brain damage. The longer you use, the more reliant you become and the harder it is to stop, but each hit does more and more damage, in a vicious cycle that is nearly impossible to break, with many users sadly dying before they are able to get clean. The film never shies away from showing the stark realities of addiction, with graphic depictions of drug use and its aftermath, including closeup shots of Nic shooting up and the needles going into his arm. Groeningen also smartly steers away from giving us an overly pat happy ending, instead closing the film on a somewhat hopeful but still somber note that doesn’t undercut the devastating power of what came before, and instead heightens it. Yes, Nic’s recovery is apparent from the fact that the film is partially based on a memoir that he wrote himself, but Beautiful Boy also shows that recovery is a constant struggle, and the film doesn’t exploit the process for easy inspirational value. Nic survived thanks to the support of his family and his own determination to get clean, but many addicts don’t make it out alive, and this fact weighs heavily on us throughout the film, especially when we are hit with the heartbreaking statistics through a postscript during the end credits. With the opioid crises fuelling headlines and drug overdoses now being the leading cause of death for people under fifty, it’s near impossible to understate the importance of a film like this. What Beautiful Boy does is offer a harrowing look at how drugs can not only ravage the life of the user but also the lives of their families, and by the end it will rip your heart out. While the film is hard to watch at times due to the subject matter, it’s extremely well acted and very powerful. The last act pretty much wrecked me. A version of this review was originally published during the 2018 Toronto International Film Festival.